Our most local fish stand was missing from our Chelsea’s Down to Earth Farmers Market on Saturday (it’s only a couple hundred feet from our door). At that time of the afternoon, although I knew there would be 3 seafood stalls at the Union Square Greenmarket, I wasn’t excited about going there, especially since I didn’t really need any other fresh produce. I decided to put together a pasta. 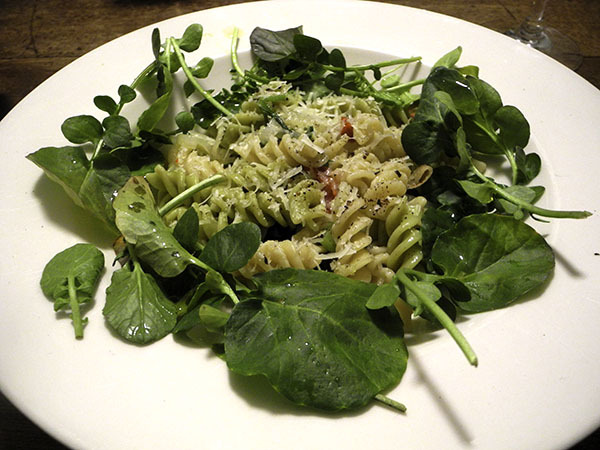 Just the day before I had bought a package of some beautiful, very hearty-looking artisanal fusilli at Norwich Meadows Farm, incorporating their own vegetables, and possibly made by Sfoglini, although there I could find no identification of the maker. It seemed this would be the time to try it out. I knew I wouldn’t need – and didn’t want – to add much to the interesting 50/50 combination of sunchoke and kale fusilli, but I did have some slightly special onions I also wanted to try out. The remaining few ingredients then more or less fell into place.